Experience Points: Are People Playing LittleBigPlanet? -My first post dealt with the mechanics and deconstructionist nature of the game. -The second post addressed the game's cooperative appeal. -The third post examined LBP's novel means of facilitating communication. -My fourth post analyzed the philosophy of creation and cultural ownership in relation to the game. With this post, I want to briefly engage with some of the hand-wringing concerning LBP's sales performance, and suggest that the game's future need not be as dreary as some would say. While it may be true that LBP is off to a slow start, the marketing push and the game's style suggest that LBP is a slow burn game that is continuing to grow into its potential. I started this series on LittleBigPlanet because I felt that the game was getting lost in the cacophony that was 2008's fall gaming season. Despite high marks from almost every media outlet, it just seemed like the game was falling outside of people's attention attention. 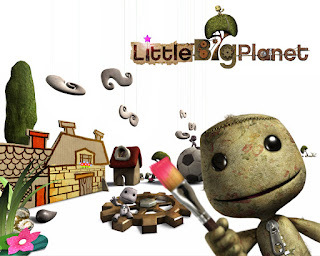 I want to examine the reasons behind this feeling, offer some thoughts on the future of LittleBigPlanet, and suggest that, when viewed in a broad context, the story of LBP is a hopeful one. There has been some talk about LBP's sales numbers, so I feel I should briefly comment on them. Most feel that LBP's sales numbers are less than spectacular given the game's quality and the anticipation that seemed to surround it. I did some quick research and it seems that the US numbers shake down as follows: In the U.S., there have been 5,700,000 PS3s sold, but there have only been 356,000 copies of LBP sold. To put that in perspective, let us compare LBP to another high profile console exclusive: Gears of War 2. Gears 2 is edging towards 2 million sold, which means that approximately 13% of Xbox 360 owners already have it. While this seems daunting, half a million people is really not that bad in the context of this fall's video game deluge. The PS3 has a vastly smaller install base than both the 360 and the Wii, and competing for people's already-scarce dollars is difficult in this economy. Games like Fable 2, FarCry 2, Gears 2, and Fallout 3 are all appealing, well-made games that also possess the luxury of having titles that end in a numeral. Franchise branding is a valuable thing, and I think we can see that the non-sequels got the short shrift this season (consider Dead Space and Mirror's Edge). The numbers for December have not been tallied yet, so I would not be surprised if the game gains some traction as word spreads and folks buy it over the holidays. As I have exhausted my (admittedly thin) empirical evidence, I will now fall back on anecdotes to make the following point: Sony must get its act together and start promoting this game. I see Left4Dead billboards when I go downtown. I see Fallout 3 advertisements while watching TV on ComedyCentral.com. I hear Devotchka in Gears 2 TV trailers. I only see LittleBigPlanet when I seek it out myself! This is a problem when it comes to growing a game's audience. I have talked to multiple friends who own at least two of the current-gen systems, all of whom I consider "gamers" in the traditional sense, and they still have little-to-know idea what LBP even is. My next door neighbor, who owns both a 360 and a Wii, game me a blank look when I invited him in to play LBP. A co-worker (also a avid gamer) asked me "It's like a kid's game, right?" 1. People want LBP to be about community. 2. The fact that the players had to create an external website to do it show something is missing from the game. 1. Bundle LBP with every PS3 in every region. LBP is a game that thrives off of player involvement, and it is one of the most convincing reasons to buy a PS3, as it is an exclusive experience. 2. Why not turn the abomination that is "Home" into an extension of LBP? That way, players could interact with dozens of other Sackboys before breaking off into groups of four to explore levels. Instead of randomly jumping in with people, player could meet and plan strategies. Rather than take up valuable bandwidth with inane dancing, sexual harassment, and insulting micro-transaction based apartment decor, put the infrastructure towards something that would actually aid in the playing of games! LBP has been out for two months, but I feel that gamers are just beginning to come to terms with the game. It is a game whose appearance is familiar, but whose feel and message diverges from tradition. First, the game plays differently than what gamers are used to: its jumps are not Mario jumps. The swinging is not like Bionic commando. While I do believe the game would benefit from a bit of control-based tweaking, I think much of the criticism stems from it being different rather than outright broken. Trying to unlearn what one has learned is a difficult thing, especially for enthusiasts raised on platforming. Say what you will about the gameplay, but it is unified in its rules and deliberate in its choices. The least we can to is give it an honest try. Second, LBP is a game whose "thesis" is radically different than most other games in any genre. LBP contains a small linear story to acclimate players to the world, but this quickly melts away when the player is allowed to take near total control. Creating a game takes time, and it is reassuring to see that every time I log on, a host of new, ingenious levels greet me. In many ways, people are only now starting to actually play the game as it was designed. LittleBigPlanet is a game that deserves to succeed. If the world were a meritocracy, something so innovative and well-crafted would be an instant success. Unfortunately, things do not come that easy. I wrote these posts to help spread the word about the game in hopes of preventing it from being lost in the increasingly complex world of video games. It is a game that gives us something new, something different, and it asks new things from us. The game can be difficult to grasp, both mechanically and philosophically, but it would be a shame if we backed away from these challenges. LittleBigPlanet presents us with a new world that is our for the taking. All we need to to is find the willingness to explore it.